Fractures of the alveolar process of the mandible are uncommon. Unfortunately, their treatment is often fraught with problems, and uninitiated surgeons tend to underestimate these types of fractures and their problems. Mandible fractures are described in early Egyptian writings. Hippocrates advocated the use of bandages and interdental wiring for the treatment of mandibular fractures. In a 3-part article published during the Civil War, Gunning wrote of using dental splints attached to elaborate external appliances. In 1881, Gilmer first described the use of bars on both arches, fixed to the teeth and each other with fine wire ligatures. Schede is credited for the first mandibular bone plating. He is said to have used a steel plate screwed to the mandible in the late 1880s. In 1934, Vorschutz described external fixation using transdermal bone screws and plaster. The Morris biphase is a refinement of that technique. The history of rigid internal fixation devices is ongoing; a new theory and a corresponding set of devices appear every few years. Clark's classes of alveolar fractures are depicted below. 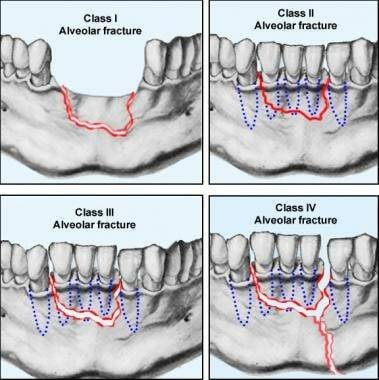 The various classes of alveolar fractures (per Clark). Simply stated, the approach to treating these injuries is to do what is necessary to reduce them and then do what is necessary to hold them in reduction until they are healed. The treatment options are somewhat limited by the lack of room for drill holes and associated hardware when the fracture involves a dentulous segment. Even with an edentulous segment, hardware is rarely practical because it usually ends up under a dental prosthesis and cannot be tolerated. As pertains to the prevalence of facial fractures in the United States, the mandible is second only to the nose. Fractures of the alveolus account for only 1-5% of all mandibular fractures, making the alveolus one of the least commonly fractured regions. The major difference in mandible fractures in countries other than the United States is in the etiology of these fractures. Some locations have less vehicular trauma because of a relative lack of vehicular transportation. Interpersonal facial trauma tends to have lower energy than vehicular trauma and, therefore, generally results in less severe injuries. Most countries other than the United States have fewer incidents concerning civilian firearms and a correspondingly lower frequency of penetrating trauma. Penetrating trauma to the mandible is most commonly in the form of a gunshot wound. For blunt trauma to produce an isolated fracture of the alveolar process, the blow must be concentrated on a segment of the alveolar process; however, this is an uncommon event. Alveolar process fractures that share fracture lines with other mandibular fractures are more common, usually representing a comminution of a body of mandible fractures. The usual presenting reports with any fracture of the mandible as a result of trauma are localized tenderness, swelling, and malocclusion. The presence of an alveolar fracture is the indication for treatment. The mode of treatment varies among patients. A dental alveolus is a tooth socket. The alveolar process of the mandible is defined as the portion of the mandible surrounding and supporting the teeth. After loss of teeth, the associated alveolar process undergoes atrophy. Cortical bone covers the exposed surface of the alveolar process and the underlying cancellous bone; tooth sockets and teeth fill the remainder of the process. Tooth sockets are lined with thin, compact bone that is penetrated by blood vessels, lymphatics, and nerves. This alveolar bone contains the embedded ends of the connective-tissue fibers of the periodontal membrane (ie, Sharpey fibers). Few contraindications exist to treating alveolar fractures. A nondisplaced class I fracture requires only observation. With other alveolar fractures, the patient's general condition may prohibit definitive treatment; examples include a chronic medical condition or results of trauma sustained when the mandibular fracture occurred. Head trauma resulting in an altered state of consciousness is the most common contraindication encountered in patients with alveolar fractures. Suspected or proven cervical spine injuries are also common contraindications. Most of these contraindications resolve with time and treatment. Hopefully, the alveolar process fracture can still be treated once the patient's general condition permits. Akin A, Uysal S, Cehreli ZC. Segmental alveolar process fracture involving primary incisors: treatment and 24-month follow up. Dent Traumatol. 2011 Feb. 27(1):63-6. [Medline]. Andreasen JO, Lauridsen E. Alveolar process fractures in the permanent dentition. Part 1. Etiology and clinical characteristics. A retrospective analysis of 299 cases involving 815 teeth. Dent Traumatol. 2015 Dec. 31 (6):442-7. [Medline]. Marotti M, Ebeleseder KA, Schwantzer G, Jauk S. A retrospective study of isolated fractures of the alveolar process in the permanent dentition. Dent Traumatol. 2017 Jun. 33 (3):165-74. [Medline]. Lauridsen E, Gerds T, Andreasen JO. Alveolar process fractures in the permanent dentition. Part 2. The risk of healing complications in teeth involved in an alveolar process fracture. Dent Traumatol. 2016 Apr. 32 (2):128-39. [Medline]. Baliga M, Shenoy V, Krishna L. Quick technique for immobilisation of dentoalveolar fracture. Br J Oral Maxillofac Surg. 2003 Dec. 41(6):417. [Medline]. Schaller B, Soong PL, Zix J, Iizuka T, Lieger O. The role of postoperative prophylactic antibiotics in the treatment of facial fractures: a randomized, double-blind, placebo-controlled pilot clinical study. Part 2: Mandibular fractures in 59 patients. Br J Oral Maxillofac Surg. 2013 Dec. 51 (8):803-7. [Medline]. An acid-etch wire composite splint can be used to stabilize an alveolar segment in selected patients. Support from a dentist is essential when using this technique. A heavy stainless steel wire is attached to the crowns of the teeth using a dental composite restorative material that requires acid etching of the enamel for adherence. A lingual splint wired to the mandibular teeth and, perhaps, to the mandible is an excellent tool for stabilizing an alveolar segment. Dental laboratory facilities are required to fabricate such a splint.